4/5 Zephyr Express 3 amp all in one DCC System is back in stock! 4/2 Model Power N Scale Close outs. 4/2 N Scale Railroading Magazine back issue bundles up for sale now and half price! 3/1 MTL N TTX Well "weathered" 16 pk has been restocked - limited quantities, so get yours now! 2/25 Micro-Trains late February 2019 releases are up! 2/7 Micro-Trians February 2019 releases are here. 2/6/2019 - N Scale Magazine 2019 March April edition is here. 1/11/2019 Kato N Scale rerelease of the UP Excursion 7 car passenger sets are up for pre-order. Atlas Coide 80 track items restocked, check out new item - ATL Code 80 Rerailer 3 pack! Broadway Limited N Scale Stock Cars with Sound are in transit and up on the website for order now! 12/11 Kato anounced the May/June delivery of their ES44AC GEVO diesels in BNSF, Union Pacific and CP livery. 12/10 Kato N Scale Union Pacific SD70ACE with Nose Headlight are in stock Just in time for Christmas! 12/9 Rapido N Scale Osgood Bradley 10 windo coaches are here. 11/21 Broadway Limited N Scale AC6000 latest run are up for immediate shipping! 11/21 Rapido N Scale Turbo Train sets are in. We have limited stock left. 11/14 Atlas N Scale GP-20 Locomotives up for pre-order. Note there is no firm ETA yet from Atlas. 11/14 Micro-Trains November 2018 releases are in stock. 11/13 FVM N Scale 2017 and 2018 Christmas cars are up for pre-order ETA is 2nd week of December. 11/3/2018 Rapido N Scale New Haven 8600-Series Coaches are in and really nice! 10/19 Atals N Scale MP15DC diesel locomotives have come in! Get them while they last. 10/5 Model Power N Scals FP-7 Santa Fe diesel loco is in stock. 9/24 Broadway Limited Rolling Thunder Receivers are back in stock! 9/7 N Scale Broadway-Limited SD40-2 with Paragon 3 DCC Sound are in. Very limited. 9/5/2018 Our latest lighting package is available now. This is a lighting customization package for the Atlas N Scale GP39-2 diesel. 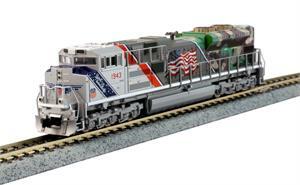 8/31 Atlas N Scale GP39-2 DC (no DCC or sound) locomotives are in stock. NE6 Caboose Limited quantities. 8/30 Micro-Trains September 2018 pre-order items are up including ATSF impact car, TTX center depressed flat car runner pack, Abrams tank kits. 7/31 Atlas N Scale Wood Reefers are up with select N Scale C-628 Locos. 7/25 MTL July 2018 second set of releases is here! 7/22 ESU Cab Control system is now up for ordering. This is an advanced DCC system with Android handheld controller. Neet stuff! 7/17 Kato N Scale SD70MAC Alaska and BNSF are due to arive on Wednesday. Limited stock left Order now. 7/11 MTL July 2018 first releases are in! 6/29 BAC N 2-8-0 with factory sound have arrived! 6/28 BWL N SD40-2 Paragon3 Sound/DC/DCC is up for pre-order! 6/18 Pre-Order your IRC N Dash 9 GE C44-9W now! 6/18 Bachmann N Old Time Caboose are up and ready to ship! 6/18 Bachmann N Old Time Boxcars are in! 6/14 N Scale Mag July Aug 2018 is in! 6/13 Broadway Limited N Scale F3 and F7 sets are in stock. 6/5 BWL N F3s and F7s are on their way. Pre-orders shipping this week! 5/30 Taking reservations for the Micro-Trains 2018 Hot Chocolate Christmas Set, 3 car CTCX tank car Runner pack, Penn Central 5 Car Heavyweight Set. 5/6 Added several Model Power Steam locomotives to site. 4-4-0 and 2-6-0 DCC compatible. 4/23 Kato lighting kits restocked! 4/23 The ATL 40 foot container 3-piece sets are in! 4/22 The MTL N ATSF Slogan 5 pack is in! 4/18 ATL N Intermodal Shipping Container 3-Pack ETA 4/25/18 - get yours now! 4/3 N Scale Mag May/June 2018 available now! Great source for projects! 3/31 Atlas Train Man N Scale 60' passenger cars are in stock. These make a great addition for any layout especially those with tighter curve radius. 3/23 - MTL late March 2018 releases are in, including weathered/graffiti! 3/15 - BWL EMD F7s Paragon3 Sound/DC/DCC up for pre-order and due in May 2018! 3/15 - Broadway Limited EMD F3s with Paragon3 Sound/DC/DCC are up for pre-order and coming soon! 3/8 - Micro-Trains March 2018 releases are here! 3/7 - Kato SD70ACE Union Pacific with Nose Headlight N Scale. 3/5 - Atlas N NSC plug door box cars, including the 911 First Responders car - Get yours now! 3/3 - Atlas Trainman GP15-1 are in stock, Get yours now! 2/21 - MTL mid-February releases including weathered cars, Weyerhaeuser Set and Wind Turbine runner pack are in! 2/20 - Kato new N SD70MAC in BNSF Swoosh and Alaska due in June 2018 up for pre-order now! 2/19 - Kato N Scale Autorack Amtrak Auto Train 4 car sets are in sock. 1/11/2018 ATT N Cupola Caboose are in! 1/11/2018 ATT N 90T Hoppers are in! 1/11/2018 The second wave of Atlas N Shay locos are in! 1/11/2018 The first Micro-Trains January 2018 releases are in! 1/2/2018 N Scale Mag Jan/Feb 2018 issue is in stock! 12/29 More IRC N SP Cab Forward added to inventory! 12/28 More items added to After Christmas Sale! 12/21 Micro-Trains N Fuselage 2 car sets are here with the 3 car weathered Trailer Train well cars and weathered UP Hopper and RIO Greande Airslide. 12/20 Kato N Scale Amtrak Autoracks in Phase III and Modern Paint comeing in January 2018 Pre-orders being taken now. 12/11 MicroTrains December 2017 releases are here. 12/1/2017 Micro-Trains Pre-Orders are updated on our site! 11/29 Restocked the N Scale CMX Clean Machine. This is the best track cleaning car on the market today IMHO. Couple it with the Aero Car ACT track fluid and you have a real winning solution to your track electrical pickup problems. 11/23 Added more N Scale Freigt Cars to the Black Friday Sale! 11/22 Micro-Trains Mid Month weathered Cars and NASA Hydrogen Cars are here. 11/22 TopHobbyTrains Black Friday Sale is on! 11/20 The Marklin complete Z scale Christmas set is in! 11/20 Black Friday early bird! KAT EMD F7&FP7 and BWL M1a/b Paragon2 at Black Friday prices! 11/16 Broadway Limited N Scale M1a & m1b Steam Locos with Paragon3 sound are here. 11/14 KATO N P42 VIA Canada 150 is in stock! 11/4 N Scale Magazine November December 2017 edition is here. 11/3 Con-Cor 2017 N Scale Christmas Cars are up with pictures. Don't miss out! 11/3/2017 Kato N Scale Milwaukee Hiawatha Olympian FP7A F7B and 9 Car Sets are on there way to us! 10/25 The FVM CSX Heritage GEVO in NY Central and Chessie Systems are in! 10/10 MTL October 2017 monthly releases are up! 10/5 Atlas GP39-2 Gold version diesels up for pre-order Get yours now! 9/29 InterMountain Railway Tier 4 GEVOs are up for Pre-order! 9/25 MicroTrains late Sept 2017 releases are up for sale! 9/12 MicroTrains September 2017 releases are in! 9/4 Broadway Limited N Scale AC6000 lcomotives with Paragon 3 DCC Sound are in stock. BHP, Southern Pacific & Undecorated locos ae still backordered from Broadway. 8/24 MTL August 2017 releases are in! 8/18 Kato Kobo VIA Rail Canada 150 Anniversary P42 Custom Painted locos are up for pre order. 8/8 Broadway Limited N Scale M1a/M1b PRR Steam locomotives are up for pre-order. Deadline is Mid August. Build to pre-orders at Broadway. 8/6 Latest Miller Engineering animated billboards are in. Check out the saucy adverts! 8/3 Added select Atlas N Scale PS2750 open hoppers to inventory. 7/31 Kato N EMD SD40-2 Early BN Bicentenial locos are in! 7/29 Atlas N S2 locos with Sound are in! After pre-orders, inventory balance is available! 7/11 MTL July 2017 releases are going up! 6/11 MicroTrains N Scale June 2017 releases are here. 5/24 Micro-Trains N Scale May weathered and graffiti cars are in stock with the Old Time Merchants Dispatch 4 pack. 5/20 Atlas N Scale U23B locomotives and Coil Cars are in stock. 5/16 FVM GP60s are in! 5/15 TopHobbyTrains is taking pre-orders for the upcoming N Scale Kato Kobo BN Spirit of 76 SD40-2 Diesel. 5/13 The first of the MTL May 2017 releases are up! 5/8 Pre-order your Atlas Trainman N Scale 60' Passneger car sets! 5/3 MTL N UP Weathered 3 bay covered hopper 4 pack restocked! 5/1 FVM wheel sets are restocked! 4/22 MicroTrains mid month releases are almost here. this month the weathered cars are just outstanding and the Pullman Heavyweights are great for post war layouts. 4/10 Micro-Trains April 2017 releases are in. 4/9 N Scale Magazine May June feature packed for the N Scale Modeler! 3/30 We have the latest MicroTrains weathered cars and the Napa Valey wine loco and 4 car set. 3/22 DCC Specialties Cobalt IP DC and DCC Switch Machines added to the site. 3/22 Kato GS4 in Daylight - More added to our allottment! 3/22 Atlas N 5701 Grain Hoppers are in and available and going fast! 3/21 Atlas N GATX 20,700 gal tank cars are in and available! 3/17 Atlas N C-630 WITH ATLAS SOUND announced by Atlas, up for pre-order soon! 3/17 Atlas N C-628 WITH ATLAS SOUND announced by Atlas, up for pre-order soon! 3/15 We are accepting pre-orders for the newly announced Kato N Scale Automatic North American Crossing gates. 3/8 Kato Kobo N Scale Milwaukee Road 156 SD40-2 Bicentennial custom painted locomotive. 3/1/2017 Kato N Scale Union Pacific ES44AC locomotives are in stock, N Scale Bethgon UP Building America sets are in, Kato Unitrack Ash Pit tracks are here. 2/28 N Scale Railroading Mag Mar/Apr 2017 100th Issue is in! 2/16 Kato Turntable Extension Cable for N Scale turntables is in! 2/16 KAT 29-352 Lighting Decoder is back in stock! 2/15 Kato N Scale ES44AC GEVO CSX release announced for a July 2017 release. Up on site for pre-order. 2/13 Atlas N Scale SD7 and SD9s are up for pre-order. 2/12 The Kato N Eurostar products are in! 2/11 The latest Digitrax Boosters are in stock These are mult amperage units so as your power needs grow all that is needed is a more powerful power supply. 2/10 FVM N GP60 is in! 2/9 N Scale Mag Mar/Apr 2017 in stock! 1/13 Micro-Trains mid month weathered and graffiti cars are up for purchase. 1/12 N Scale Con-Cor Trump Inauguration car pre-orders are being taken. 1/12 N Scale Micro-Trains January 2017 releases are in stock. 1/10 The first wave of Intermountain Railway SD40-2s are in and flying off the shelves! 1/6 The Kato N Siemens ACS-64 are in and flying off the shelves! 1/4/2017 FVM release of their N Scale GP60 late version Norfolk Southern Horse Head and Cotton Belt are up for pre-order. 12/27 Bachmann N Scale GG1 second shipment is here. Limited sound version left! 12/26 InterMountain SD40-2 first batch due Jan 2017! 12/23 MicroTrains Dec 2016 late month releases are here! 12/21 N Scale Magazine Jan/Feb 2017 issue is in stock! 12/14 Lionel's HO Polar Express is in stock! 12/11 Micro-Trains December 2016 releases are here! 12/6 They are here! Kato N SDP40F are in-stock and all pre-orders are being filled now! Additional KAT SDP40F Maersk expected any day now. 11/29 Micro-Trains Pre-Orders and up for December. These are the 5 car Army heavyweights, 4 car Civil War and 3 car American car and foundry sets. The Donald Trump Presidential car #45 in the Presidents Series is up for pre-order. 11/23 BWL N GE ES44AC up for pre-order! 11/22 The new FVM N Scale GP60s in Cotton Belt and Norfolk Southern and Canadian National ES44AC locomotives are here. 11/18 BWL N SD70ACe up for pre-order today! 11/17 BWL N PRR T1 4-4-4-4 up now for Pre-Order! 11/16 FVM N Early GP60 Cotton Belt locos are up for Pre-Order! 11/8 Micro-Trains November 2016 releases are here Nice! 11/5 Atlas N Scale RS1 locomotives are up for Pre-Order. Lots of branch line road names for your layout! 11/2 Atlas Trainman GP15-1 diesels up for pre-order! 10/26 MTL October '16 Graffiti offerings in stock, as well as MTL N UP conversion car! 10/26 MTL N White Christmas Delivery Train Set is in stock! 10/22 Con-Cor 2016 Christmas cars up for pre-order on our Christmas page. 10/21 N Scale Clean Machine restocked, along with replacement pads, ready to ship! 10/18 N Scale RailRoading Nov/Dec 2016 is up and ready to ship! 10/14 N Scale Mag Nov/Dec 2016 is up and ready to order! 10/6 TopHobbyTrains is taking pre-orders for the Con-Cor 2016 Christmas Car. 10/6 Micro-Trains October 2016 releases are here. Nice assortment and the 2016 Christmas Car too. 10/5 Kato N Scale FEF Steam loco Union Pacific 838 are in stock. 10/4 Kato announced the March 2017 release of their N Scale GS4 in SP Daylight and BNSF Black Excursion with a 10 car passenger set and companion 2 car articulated set. 10/4 Kato announced the March April 2017 an new N Scale Bethgon varient of their coal porter the Protein covered gondola hopper. We are taking pre orders now. 9/29 MTL N Napa Valley Wine set restocked! 9/26 MTL N Weathered Grab Bags are up! Limited Quantities! 9/9 Lionel HO Scale Polar Express Locomotive with Sound and passenger cars are up for pre-order. This is hot! 8/28 - The Micro-Trains August 2016 weathered cars are in here. Nice! 8/12 - N Scale Magazine September October 2016 is here! 8/3/2016 - Kato N Scale F7 Northern Pacific AB sets are in stock, Kato N Scale SDP40F Amtrak PhaseII is here! 7/19 We are accepting pre-orders for the Kato N Scale Eurostar. 7/10 Micro-Trains July 2016 releses are in stock. 7/8 Kato N 10-1324 TGV Carmillon Duplex Powered 10 car set N Scale is in stock. 7/5/2016 Kato N Scale latest SD70ACe BNSF Swoosh and CSX are in stock. Amtrak 2 and 4 car Amfleet Phase I sets are in stock. 6/27 N Scale Railroading Magazine July August 2016 is here filled with great reading for that lazy day at the beach! 6/24 Atlas N Scale C420 Locomotives, BLMA Trinity 5660 PD Covered Hoppers and NE-6 Caboose are in stock ready to ship to your layout. 6/19 Happy Father's Day. LokSound Programmers at reduced pricing! 6/17 TWX N scale Bicentennial Trailers and Covered Hopper are up for pre-order! 6/11 MicroTrains June 2016 releases are up on teh site. Really nice N&W this month. 6/10 Atlas N 42' Coil Steel cars up for pre-order. New road names! 6/9 N Scale Magazine for July August 2016 is in. This one is feature packed! 6/6 Atlas N 31K Crude Oil Tank Cars, (STAX, PPRX) up for pre-order. 6/6 Kato Amfleet Phase 1 passenger cars 2 and 4 car sets up for pre-order. 6/1 Kato N Scale Christmas Set for 2016 Operation North Pole Taking pre-orders now for October delivery. 5/4 Pre-Order for Atlas Trainman 90 Ton Hoppers are up! 5/4 Pre-Orders for ATLAS SD-24/SD-26 Locos are up! 5/3 Pre-Orders for theupcoming Micro-Trains 2016 Halloween tran set and 56' General Tank Car Union Tank runner. Reserve yours today. 5/1/2016 Micro-Trains N Scale May 2016 releases are announced and will be in the shop on May 9th. 4/20 May June 2016 issue of N Scale Railroading is here. Feature packed for teh N Scale modeler. 4/16 N Scale Magazine May June 2016 edition is here. 4/13 MicroTrains Weathered and Graffiti cars have been announced for April and will be in the shop 3rd week of April. 4/11 Kato N Scale F7 A-B set in Great Northern Freight color paint are here. 3/31 Micro-Trians N Scale April release will be in the shop April 10th get your orders in! 3/20 Rapido N Scale Panorama 73 foot Smooth Side Baggage Cars are up. Firm Pre-Order date is 4/10/2016. Rapido is building to order. 3/19 Restock of the Kato N Scale Santa Fe Cigar Band F7 locomotives. 3/4 Restock of select FVM Christmas cars Last chance to get these! 2/19 N Scale Railroading March April 2016 Issue is here. Full of great N Scale ideas. 1/29 More of the Atlas N S2 Diesels with LokSound and the N Scale GP38-2 diesels have come in. 1/28 Latest MicroTrains Pre-Orders are up for order. 1/25 MicroTrains January Weathered Cars are here. 1/25 Restock of MicroTrains trucks and couplers. 1/11 MicroTrains January 2016 the first release of the year are all here! 12/24 January February issue of N Scale Railroading is in stock. Nice edition for the modelers out there. 12/24 The latest Atlas N Scale 4-4-0 Steam locos are in stock. 12/18/015 The Bachmann N Scale GG1 with Value Sound is up for Pre-Order at a very low introductory price! 12/10 January February 2016 N Scale Magazine is here. 12/9 The most recent Atlas N Dash8-40CW new road names/numbers are up for pre-order. Take a look and reserve yours now! 12/4 The Kato Kobo N Scale Custom E9 Union Pacific Excursion locomotives are in stock. Very nice work from Kobo. 12/3 Micro-Trains December 2015 releases are in stock. 11/27 Bachmann N Scale SD45 with Soundtraxx Value Sound are in ATSF, PRR, NP, Erie. Rio Grande is still pending. 11/27 CMX N Scale & HO Scale Clean Machine Track Cleaning Cars are back in stock. 11/26 Kato N Scale 4-8-4 Union Pacific FEF 844 STeam locomotives are back in stock! 11/18 Kato N Scale FEF Watertender and Excursion Passenger sets are in stock. 11/10 Micro-Trains November 2015 releases are in stock. Ringling Heavyweight Hospital, Baby Ruth, Postcard Series and many more. 10/30 added pre-orders for the upcoming BLMA N Scale Trinity 31k Crude Oil Tank Car DPRX and TILX roads. 10 /30 MicroTrains 2015 Christmas car is up for PreOrder. As always these are limited. 10/19 Atlas N Scale SD35 diesels are in stock. 10/14 N Scale Magazine November December 2015. Another great edition. 10/14 N Scale Railroading November December 2015 is in. This issue is packed with great ideas for your layout modeling. 9/30 BWL EMD E6,7,8 are in and all pre-orders have been fulfilled! 9/29 N Scale Railroading Sep/Oct 15th Anniversary edition is in! 9/18 Kato Maxi-I Double Stack Car TTX New Logo Sets are in! 9/14 MicroTrains Weathered and Graffiti cars are announced for Pre-Order. 9/1 The Bachmann N Scale 4-6-2 Pennsy K4 Pacific Steam Locomotives will be here this week. Order your now so that we can ship them out rigt after the holiday! 8/25 Kato Kobo N Scale Union Pacific E9A and E9B Excursion locomotive pre orders. 8/24 MTL Weathered cars for August are in stock along with the Ringling Brothers heavyweight observation passenger cars and 8 car flat car sets. 8/6/2015 Kato N Scale Gunderson Maxi-I 5 car sets with 10 40 foot containers in Maersk have come in. 7/29 Get your ATL N S2 Locos w/sound while we have some left! 7/28 Pre-Order your BWL N NYC 4pk Steel Cars now! 7/21 TopHobby is taking Pre-Orders for the BWL Stock Car with sound now. 7/10 Kato Announced the December release of their N Scale F7 locomotive in the ATSF Cigar Band and Blue Bonnet colors. TopHobbyTrains is taking pre-orders. 7/7 Atlas N Scale DC version of their S2 locomotive is in stock. 6/10 GHB International N Scale Pennsylvania L1 2-8-2 Mikado Steam locomotive in Brass is here! 6/10 Rapido N Scale Burlington Northern Business Executive 4 car set is back in stock. 6/9 MicroTrains June 2015 releases are in stock This month there is a new car body. The Old Time Ciovil War Era Tank Car. 5/16 FVM CSX Heritage Locomotive Series. to release in five 4 loco groups. The first 4 locos in Group 1 will release end of 2015 Group 2 will release early 2016. These are build to order so only enough will be built to fill pre-orders. 5/12 Kato Siemens ACS-64 Amtrak Amfleet Electric sets and coaches are up for pre order. 5/12 Rerun of trhe Kato N Scale FEF Northern. We will continue to offer our FEF sound package and passenger car lighting. The Kato version with sound will be on special order only from TopHobbyTrains. The 7 car excursion set and water tenders are also available. New pre-order page for MicroTrains products is now available. This will make it easiuer to order your favorite MT products. 5/5 ATT HO Genset w/THT DCC/Sound available, there's only one left! 4/29 FVM N Scale 33" .540" metal wheel sets for MicroTrains and Athern are finally back in stock. 3/28 Limited edition FVM Hiawatha collectors sets are up for Pre-Order. First Come First Served. 3/25 Micro-Trains N Scale Weathered and Graffiti cars for March are in. This month the 4 cars set Covered Hopper is featured with full weathering and graffiti. Nice addition to your layout. The N Scale Baltimore and Ohio Heavyweight Diner Passenger car is also in stock. 3/20 The New Kato release of the N Scale EMD F3 Locomotives are in. We have the Union Pacific road #1404, 1405 and B Unit 1412C in stock. These locos look great on all transition era layouts. 3/14 FVM announced the release of their HO and N Scale Hiawatha Steam locomotive and passenger cars. Due in at the end of the year. 3/10 The N Scale Bachmann 2-8-4 Berkshire is in stock. This loco has Soundtraxx Tsunami DCC Sound installed at the factory. 3/3/2015 TopHobby is now stocking a new line of speaker. Check out our Knowles speakers for N Scale More to come in the nex weeks. 2/25 MicroTrains February 2015 Weathered and Graffiti Gondola and Box Cars. The N Scale Alice in Wonderland Set is in stock. 2/24 Atlas N Scale H16 Diesels and SD9 Diesels are now in stock. 2/14 Rapido N Scale Panorama Passenger Cars have started to come in. We have them up on the Rapido page. 2/4/2015 Added remaing inventory of the new Rapido N Scael GMD-1. Very limited now. 1/30 Rapido N Sclae GMD-1 locomotives are in. Selling very fast. 1/29 Updated Kato Sound Box information and video. ETA is February 2015. 1/24 FVM N Scale B&O I-12 Wagontop caboose in stock. 4 eras to choose for with 3 road number each. 1/23 Kato N Scale Unitrack double track crossover kits are in stock. 1/12 MicroTrains January 2015 releases are in. The KCS SW1500 is in this batch. 1/9 Atlas N Scale GP30 Phase 2 Diesel Pre orders being taken. 1/8 Kato newest N Scale Unitrack switch tracks are up on the site. These are right and left corssovers. Both have the switch motors built into the roadbed. 12/25 TopHobbyTrains is taking pre-orders for the Broadway Limited HO Scale Operating Water Tower. Really cool motorized accessory with sound! 12/24 Broadway Limited N Scale PA & PBs are here and going very fast this Christmas! 12/18 N Scale Railroading January February 2015 is in stock. 12/18 N Scale Magazine for January February 2015 is in stock. Great issue this month! 12/4/2014 We are accepting Pre-Orders for the upcoming MicroTrains Southern Pacific N Scale SW1500 Diesel Switcher. 12/1/2014 TopHobbyTrains Kato N Scale FEF Steam Loco video showcasing the TopHobbyTrains Kato FEF Sound package featuring the Soundtraxx Tsunami Micro DCC decoder is up on the home page. 11/25/2014 The MicroTrains N Scale SW1500 in Burlington Northern Green is in stock. We have both road numbers. 11/17 Kato N Scale Starter Sets are back in stock Featuring the F7 EMD Diesel Locomotives in the popular Santa Fe ATSF Bluebonnet, Red ATSF Warbonnet and Uuion Pacific Uellow & Gray. 11/17 Atlas N Scale True Track is back in stock. Most pieces are available including switch tracks. This is a great N Scale and HO Scale Track system for quick and easy layout setup. 11/13 Atlas N Scale Dash 8-40B & 8-40BW 8-40BWH diesels are in stock. 11/13 Micro-Trains November 2014 releases are in. This months highlights are the N Scale SW1500 Nose Art Series Diesel and its companion Caboose.and the second Christmas Post Card Series boxcar. The 1972 series is in stock bringing back those memories when this car was first releases. 11/8 Kato announced the all new Analog Sound Box (ASB) TopHobbyTrains is taking Pre-Orders for the expected January 2015 release. The unit will come with teh Soundtraxx 1st generation diesel sound container. These sound units are for DC layouts and will allow the DC modeler to have sounds without DCC. The sounds come from a speaker to the unit which attaches to your power pack. Aux ouputs are available for external speakers that can be placed around your layout. 11/7/2014 Kato Kobo Custom painted N Scale F40PH Florida Tri-Rail, CSX Dark Future and Boxcar logos, Denver & RioGrande Western Ski Train pre-orders being tanke now. 10/27 Put up In-Stock Broadway Limited HO Scale Steam an HO Scale Diesels SW1500 AC6000CW and more to come! 10/24 Micro-Trains Graffiti and Weatheredcars are in stock, The Amtrak Z Passenger Set and the Z Scale Christmas sets are in. 10/23 TopHobbyTrains now stocks Atlas HO Scale Code 100 and Code 83 Track and track accessories. Much more to come! 10/22 N Scale ConCor Christmas Car for 2014 is up for Pre-Order. This year it is Comet the Reindeer number 5 in the Reindeer series. 10/17 N Scale Magazine November December 2014 edition is in. Another great issue in time for the train season. 10/10 Kato announced the early 2015 release of their N Scale F3 locomotives in Union Pacific, Southern Pacific Balck Widow, and Chicago Burlington & Quincy CB&Q freight paint schemes. We are taking Pre-Orders. 10/10 Fox Valley Models S70ACE N Scale Locomotives are all in stock. We just received the Wabash, Jersey Central. Illinois Terminal, Penn Central Lackawanna & Norfolk Southern 30th Anniversary loco. 10/9 Microtrains October 2014 releases are in stock. This month the 1st Post Card cars are featured along with the CP Rail Bay Window caboose. 10/6 TopHobbyTrains is accepting Pre-Orders for the Atlas N Scale 4-4-0 Steam Locomotive. 10/3 Kato N Scale Superliner II Transition Sleeper 39027 is in stock. 10/3/2014 Atlas N Scale Shay is up for Pre-Order. 9/25 Micro-Trains Christmas 2014 Toy Trunk Line sets are in. These have an Atals 4-4-0 Steamer with 4 freight cars hauling fantasy Christmas gifts. 9/10 Micro-Trains September 2014 releases are in stock. This month look for the 5th WWII Nose Art car, the 12th car in the Tank Car Series & N Canadian Pacific COFC Flat Car w/containers Runner Pack. 9/5 Fox Valley Models N Scale SD70ACE locomotives will be here in 2 releases in September and October. We have reduced our pricing and all pre orders will be at the new lower price. Quantities are limited at this pre-order price. 9/1 CMX Clean Machines in HO and N Scale are back in stock. The DCC Ramp Meter 3 is in stock. 9/1 MicroTrains Z Scale Southern Pacific F7 A&B in Bloody Nose paint are in stock. 9/1 MicroTrains N Scale B&O Chessie Safety Caboose 4 car packs are in stock. 9/1/20014 Micro-Trains N Scale SW1500 Union Pacific Diesel Switsher in 2 road numbers is in stock. 8/27 Atlas N Scale Code 80 Remote #4 switch tracks and other code 80 items are back in stock Limited supply left. 8/17 N Scale Railroading Magazine September October 2014 issue is in stock. 8/15 ConCor N & HO Scale 53' containers are in stock. 7/26 MicroTrains Z Scale Sets are in stock. 7/26 FVM N Scale Wagontop box Cars are in stock. Great Pricing! 7/21 Con-Cor N Scale Superliners are back in stock We have Undecorated, P2, P3 & P4 5 car sets. 7/21 Pre-Orders for the 2015 release of Atlas N Sclae SD50 and SD60 locomotives are being accepted. 7/7 Kato N Scale VIA and Illinois Central Passenger sets and E8 locomotives are in stock. 6/25 Micro-Trains Weatherd cars for June 2014 are in stock. These include the BNSF weathered set, Old Time freight car set and Georga Pacific modern log car. 6/24 TopHobbyTrains is taking pre-orders for the newly announced Kato N Scale 4-8-4 Northern Union Pacific 844. 6/24 N Scale Railroading July August 2014 is in stock packed with great information and photographs. 6/16 Micro-Trains June 2014 releases are finally here. Seems later and later each month! 6/4 Kato N Scale ES44AC GEVO in UP BNSF CSX CN and CP will be released ove rhte next several months. Pre Order yours now. 6/2 Kato N Scale F2 & F3 2 diesel sets are in stock. ACL, CB&Q, RI & C&NW all here! 6/1 Digitrax decoder restock and stock of the new DZ146 decoder. 5/29 Micro-Trains N Scale Christmas Postcard series 1st 3 cars will be released October November and December 2014. Pre-Order being accepted. 5/26 For one day only, Memorial Day 5/26/2014, get free domestic Super Saver Shipping from TopHobbyTrains for all in stock items with invoice totalling $100 or more. 5/21 Atlas N Scale GP38-2s are in and going fast! 5/5 TCS WOW Sound decoders or on sale at a very low price for a limited time. 4/16 Walthers N Scale 130' Motorized Turntable with DCC is back in stock. This unit is good for DC as well as DCC. We have it at a great price! 4/15 FVM announced the late 2014 release of several new GEVO ES44AC locomotives. CitiRail, UP Flag with PTC antenna and GE Evolution Hybrid paint. 4/7 Broadway Limited N Scale PA, E6, E7, E8/9 and teh all new Centipede are all up for Pre-Order on the site. 4/7 Additional Intermountain N Scale SD40-2 locomotives are now on the site for Pre-Order. 4/7 Micro-Trains April 2014 releases are in. 4/6 N Scale Magazine May June 2014 is in stock. 4/6/2014 Con Cor N Scale Amtrak Auto Train Autoracks are in stock. These are all new with Micro-Trains couplers and metal wheels. Very nice. 3/24 Micro-Trains mid month weathered and graffiti cars are in including the BNSF covered hopper 2 car set. 3/22 Broabway Limited has announced the release of the N Scale Baldwin Centipede in PRR, Seaboard, NdeM and a fantacy Union Pacific set. These will be in singles an 2 diesel sets all with Paragon2 sound! 3/11 Atlas N Scale 4-4-0 American Steam Locomotives are in. These are little Gems! B&O, DL&W, NCR & T&P, Atlas N Scale 11,000 Gal Tank cars are in. 3/7 Kato announced the April limited release of the GO Transit MP40PH in N Scale. This is a Kato Kobo custom painted model. We are taking Pre-Orders now. 3/7 Broadway Limited N Scale PRR 4-8-2 M1A and M1B steam locomotives will release January 2015. TopHobbyTrains is accepting Pre-Orders now. 3/5 Restocked Soundtraxx speakers and decoders. If you don't see it email us and we will get it for you. 3/1 Restocked the last of the Broadway-Limited N Scale E Units. 2/28/2014 Kato N Scale Alaska E8s and Passenger car sets are in stock and going fast! 2/24 Micro-Trains N Scale weathered outside braced 40' box car 4 car runner pack and twin bay hoppers are in. 2/20 FVM N Scale Norfolk Southern ES44AC GEVOs latest numbers are in stock. FVM HO Scale 4-4-2 Hiawatha #1 is back in stock. 2/20 N Scale Railroading March April 2014 edition is in. 2/18 Micro-Trains Blue Log Car and Federal Paper Log Car runner packs are in stock. 2/17 Kato has announced the May import of a Japanese Prototype E655 Series “NAGOMI” powered 5 car set. It will be accompanied by the Imperial Coach Car. These will be in short supply so reserve yours now. 2/16 FVM Preorders for the new N Scale Southern Silver Side Gondola are up on the site. 2/14 MTH HO Scale SD70ACe NS Heritage with factory Proto Sound. Special Purchase in very limited supply. Store stock only. These are a must have! 2/12 Pre-Orders for the latest Intermountain SD40-2 in DC, DCC and DCC Sound featuring the LokSound Micro sound decoder. 2/8 The March April 2014 edition olf N Scale Magazine is in. 2/7 Micro-Trains February 2014 releases are in the shop. 2/6 Kato N Scale Hiroshima Street Tram is in stock. 1/21 Broadway Limited E6 E7 E8/E9 are in stock. Order early for best selection. 1/14 Kato announced the May/June release of Illinois Central and VIA 4 and 6 car Passenger sets with matching E8 Diesels. The CNW and Alaska sets are on schedule to be out in February 2014. We have additional Alaska sets coming in so if you are an Alaska fan get your now. 1/12 Rapido annonced the new N Scale GMD-1 Diesel Locomotive. TopHobbyTrains is taking Pre-Orders. ETA is end of 2014. 1/2/2014 Broadway Limited Eunits will be in the shop mid January. 12/27 The Bachmann N Scale NW2s are coming in we have the NYC, Undecorated and Great Northen in stock. 12/27 Atlas Code 80 Rail joinrs are back! 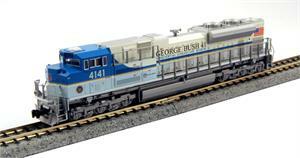 12/27 Kato HO Scale P42 40th Anniversary Phase I paint is in stock. 12/23 Micro-Trians December Weathered and Graffiti cars are in stock. This round includes an Chrismas Graffit and New Year Graffiti car. 12/23 Kato N Scale Alpine Glacier 3 car powered and 4 car add on sets are in along with the close coupler sets. There are enough couplers in the pack todo the six cars and the loco. Limited stock left on both the 3 car and 4 car. 12/17 CMX Clean Machine in N Scale and HO scale are back in stock. 12/14 N Scale Railroiading for January February 2014 is in. 12/14 Restock of many Atlas N C420 Diesels. 12/11 The Micro-Trains Decembe 2013 releases are in stock. Also restocked the MT Z Scale Micro track. 12/2/2013 Atlas C420 N Scale have come in. We do have moset road names still in stock. 11/27 Kato N Scale Caltrain MP36PH locomotives are in stock. These are Kato Kobo custom painted and really nice! 11/26 Micro-Trains announced the spring 2014 release of their N Scale SW1500 Diesel. It will be DCC Ready! 11/24 Micro-Trains November 2013 Weathered cars, Ringling Bros wagons and Z Scale ATSF Yellow bonnets are in stock. 11/9 Micro-Trains November 2013 releases are in stock. The Happy Hanukkah car is featured this month with the 2nd Tank Car in the Tank Car series and the 7th in the Brewery series. 11/5 FVM announced their Christmas cars. 3 this year! 10/29 Micro-Trains N Scale Weathered Cas for October 2013 are in stock. 10/24 FVM N and HO Scale Hiawatha 4-4-2 Atlantic Steam locomotives are in stock. 10/11 Fox Valley Models N Scale GP60M in BNSF are in stock. 10/7 Atlas N Scale 5250 Covered Hopper cars are in stock. 9/28 KAto N Scale SD70ACe Norfolk Southern Heritage Diesels are in stock Penn Central, Savannah & Atlanta, New York Central. 9/17 Kato Kobo announced the custom painted MP36PH in Caltrain paint. As always this is a special release from Kato. 9/10 Kato Kobo N Scale Caltrain sets are in stock. 9/9 Micro-Trains September 2013 releases are in stock. 9/9 Kato announced the all new N Scale Autorack 4 packs. They will release in February and have Amtrack in 2 different packs, Canadian National and Canadian Pacific. 9/6 FVM N Scale Milwaukee Road Rib Side Caboose have come in. Limited stock available. 9/6 The first 6 Kato Norfolk Southern Herigtage series locomotives have arrived. These are Erie, Illinois Terminal, Lackawanna, Virginian and Norfolk Southern 2 road numbers. 9/5 Restock of many Walthers N Scale Cornerstone building kits at great low pricing. 9/3 Kato N Scale GG1 Congressional Silver PRR is in stock in limited quantities. 9/2 We added several HO Scale Kato SD40-2 Diesel locomotives to our HO Scale Clearance Site. Remember that items in this area have an additional 10 percent off of our normally low pricing!!! 9-2-2013 Added the new Bachmann HO Scale Porter Side Tank locomotive. We have them at a great low price. Very nice detailing on these new Bachmann locos with DCC factory installed right out of the box! 8/15 Kato announced the custom decorated N Scale P42 Diesel in New Haven colors. 8/12 N Scale Magazine September October 2013 edition is in stock. 8/8 Fox Valley announced the release of the long awaited N Scale GP60M series to start September 2013. We still have some preorder slots left so order yours now. 8/6 Kato N Sclae Pre Orders Alaska Railroad Chicago & North Western Railroad. 7/24 Micro-Trains Weathered N Scale Norfolk Southern freight set & Weathered Williams Ortner hopper car have come in. 7/16 Kato N Maxi Well AOK with Hanjin containers 5 car set are in stock. 7/15 Kato announced the November release of the 75th Anniversary version of the Glacier Express. 7/8 Thomas & Friends HO Scale Train Sets. 7/3/2013 Micro-Trains July 2013 releases are in. 6/27 Atlas N Scale GP38, GP40 and SD60's are in stock. 6/24 The latest Micro-Trains N Scale Weathered cars have come in. Very nice! The Canadian Pacific 5 car heavyweight passenger car sets are in. 6/12 July August 2013 N Scale Magazine is in stock. This ios a very nice edition. 6/11 The June 2013 Micro-Trians release is in stock and includes Serman's March, Brewery series #2, Milwaukee Road RPO Heavyweight. 6/10 The final 3 Norfolk Southern ES44AC GEVOs are in stock All are now in stock ready to ship to you. 6/5 CMX N Scale Clean Machine Track Cleaning Car is back in stock. 6/5 Aded the latest Miller Engineering Animated billboards to stock. These are great for addig movement, color and excitement to your layout. 5/28 Micro-Trains Weathered Eastern Diesel Freight Set, BNSF 2 bay coveredn Hopper and 60' box car. The Santa Fe 4 Car Runner Pack & Pacific Fruit Express 8 car runner pack all in stock today. 5/8 FVM Limited production release of the NS Heritage Lehigh Valley Initial Paint with smaller nose diamond and stripes is in. VERY LIMITED STOCK. 5/8 FVM Limited production release of the NS Heritage Nickel Plate Road with smaller cab side road number is in. VERY LIMITED STOCK. 4/30 Walthers N Scale DL109s are in stock. 4/25 Micro-Trains N Scale Weathered and Graffiti H&S Multi Pack and Weathered US Army Tank Car are in stock. N Scale CP Rail 4 car 40' Plug Door Box Car Runner Packs are in stock. 4/9 Restock of many Micro-Trians N Scale Laser kits. 4/3 Kato N Scale Glacier Express 3 car powered and 4 car add on sets are in stock. Limited supply available. 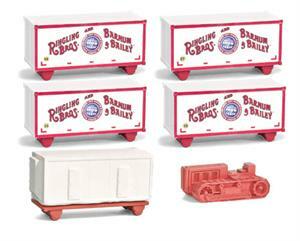 3/28 Micro-Trains announced the August release of the N Scale Ringling Bros PT Barnum Circus Set. TopHobbyTrains is taking orders now. 3/27 Micro-Trains Weathered NS Gondola Runner Pack and Union Pacific Box Car and C&O Runner Packs are in stock. 3/20 Intermountain N Scale ATSF CE-1 Caboose are in stock. These are highly detailed models well worth a prominent spot on your layout. 3/19 Kato Kobo N Scale Caltrain 5 car set will be released in May. TopHobby is taking pre-orders. This is a custom lettered and decorated limited edition set that will go nicely with the Kato Caltrain F40PH diesel. 3/15 Kato N Scale Congressional Silver PRR GG1 and Budd Business Car BNSF #1 “Gerald Grinstein” 2nd release pre-orders being taken at TopHobbyTrains. 3/13 TopHobbyTrains is accepting Pre-Orders for the all new Atlas N Scale S2 Diesel. This is a new loco for Atlas and Atlas' first loco with a factory sound option. 3/12 TCS K5D7 Decoder for the Kato N Scale Metra F40PH diesel is in stock. 3/9 Kato N Scale Maxi IV Well Gundersons in AOK and BNSF are in stock. 3/6 Soundtraxx 828036 sound decoder for Atlas GenSet locomotives is in stock. 2/16 Kato announced the release of new road numbers on their SD40-2 diesels. These will ll release March and April. They also announced the release of new Maxi I 5 car Gunderson sets. 2/15/2013 Micro-Trains Z Scale New York Central F7 A&B are in stock. 2/10 Kato N Scale SD70ACe Norfolk Southern Heritage 12 diesel series announced for summer 2013 release. 2/10 Kato announces the release of the N Scale F7 A&B Santa Fe Yellow Bonnets, Late version of the N Scale F3 A&B Units, New Maxi IV Gunderson Well car sets CSX and Swift containers, Super Chief 8 car and 4 car sets and the 10 car El Capitan set with new car numbers. 2/8/2013 Micro-Trains February 2013 releases ae in stock along with the awaited Union Civil War Commerative N Scale set. 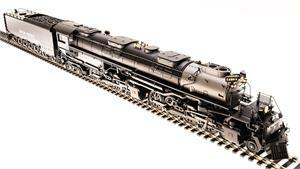 1/26 Atlas N Scale 4-4-0 American Steam Locomotives are in stock These are really hot! 1/24 Fox Valley Models N Scale GEVO in BNSF, FERROMEX are in stock. 1/24 Micro-Trains weathered Santa Fe box car and CN 100 ton hoppers are in stock. 1/8 Kato big news!! Release in the US of the N Scale Glacier Express 3 car set and add on car 4 car set. Limited availability and first come first served on this one. 1/8 Kato Pre-Orders for the N Scale SD90/43 MAC in San Luis & Rio Grande paint!. This is a real beauty! Also will be available in Union Pacific "We Will Deliver". 1/8/2013 Kato announced the release of the N Scale F40PH in Chicage Metra colors. Looks like it will be beautifully done with road specific detailling. Look for TopHobbyTrains' sound package with full lighting soon after the release. TopHobbyTrains is taking pre-orders for the diesel now. 12/21 The Red Caboose N Scale 57' R-70-15 Tropicana Refrigerator Cars are in stock. 12/21 Atlas N Scale Standard Cupola Caboose in stock. Atlas N scale Extended Vision Caboose in stock. N Scale 33,000 Gal Tank Car in stock. 12/20 The 2013 January / February issues of N Scale Magazene and N Scale Railroading are in stock. Lots of great atricles and ideas. 12/16 The FVM N Scale Christmas Car "Naughty or Nice" is in stock. Beautifully done with body mounted Micro-Trains couplers and FVM metal wheels. 12/12 Micro-Trains announced the release of Weathered N Scale Union Pacific Steam Freight set and a single weathered 3 dome tank car. 12/8 Kato announced a container picker vehicle. Looks really nice from the pictures! 12/7 Kato announced the release of NW2 Diesel in ATSF and CB&Q and GE P42 Diesels in Phase Vb Pre-orders being taken for January 2013 delivery. 12/7 Kato F40PH Metra in 3 road numbers and named diesels Pre-Orders being taken. 12/6 Restock of the Kato N Scale 11 car California Zephyr Passenger set. 12/5 Kato N Scale NW2 diesels in Burlington Northern, Northern Pacific and Union Pacific are in. 11/26 Micro-Trains Z Scale F7 A & B units are in stock. Beautifully done with headlight and MARS light lenz included in the box. 11/21 Atlas N Scale GP-7s and GP-9s are in stock. 11/1 Kato restock of the N Scale SD70ACe MP and WP roads. 10/27 N Scale Magazine November December 2012 is in stock just in time for the holiday building season. 10/27 Micro-Trains Christmas sets and Weathered cars are in stock. 10/12 BLMA N Scale Trinity 64' Reefer Box Car - CEFX (2nd Run) are in stock. 10/12 Restock of Woodland Scenics N Scale figures and select products. 10/8 Micro-Trains October 2012 releases are in stock. 10/5/2012 BLMA N Scale Spine Cars are in. These are super detailed and will look great with all your modern inter-modal equipment. 9/27 N Scale Railroading Magazine November December 2012 is in stock. 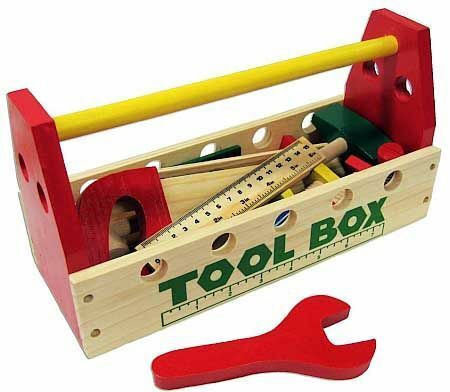 Great for the holiday building season. 9/27 Micro-Trains announced an 8 car runner pack of the PFE Reefers. This will be a great addition to your west to east drags. 9/6 Kato N Scale F40PH Amtrak with Ditch Lights in stock restock of the other road names also. 9/6 Kato announced the November release of the N Scale CB&Q Silver Streak Train Set with E5 diesels. 9/6 Kato N Scale Superliner 4 car sets are in stock. Amtrak Step-Down Coach and Baggage Car 2 car set in stock. 9/1 Micro-Trains September 2012 releases put up on site. 8/12 Kato N Scale F40PH with new tooling and front Ditch Lights are in stock. 6/29 Added Micro-Trains N Scale Civil War Commerative sets. Pre-Order for November and December delivery. 6/23 Atlas Trainman N Scale Trash Flat Cars are in stock. 6/15 July/August 2012 edition of N Scale Magazine are in. 6/9 Micro-Trains June 2012 releases are in stock. 5/31 Fox Valley Models N Scale NS Heritage Series additions for delivery at ethe end of 2012. 5/25 Micro-Trains N Scale Weathered B & O Set with 4-4-0 Model Power Steamer. 5/21 Kato HO Scale SD90/43MAC diesels are in stock. 5/16 N Scale Magazine May June 2012 issue is in stock. 5/7 Micro-Trains May 2012 releases are in stock. 5/4 Kato Maxi-I and Maxi-IV Well Cars are in stock. 5/4 Kato N Scale Bicentenial GG1 and 5 Strip Red GG1 are in stock. 5/4 Kato N Scale VRE Bi-Level cars are in stock, Amtrak Amfleet coach, Viewliner and Baggage cars are in stock. 4/13 Fox Valley Models has announced the release of the Hiawatha locomotives #2 and #3. A must have for any Milwaukee fan. 4/13 Fox Valley models has announced the release of the N Scale Norfolk Southern series. This should be a great looking set of 9 GEVO ES44AC diesels! 3/25 Intermountain N Scale 5277 cu ft box cars are in stock and N Scale baggage cars are in. 3/16 Kato announced the Unitram series of track including the previoulsy announced V50 starter sets. 3/2 The March April 2012 edition of N Scale Railroading is in stock. 2/24 Kato N Scale P42 Genesis Anniversary Phase I, II, IV Pre-Orders are now up on the site. 2/19 Con Cor HO and N Scale Comet Collector Train Set and add on Car Pre-Orders are now on the website. 2/16 Atlas TrainMan N Scale ACF® 50' 6" Box Car are in stock. 2/10 Kato N Scale SD90/43 diesels are in stock Japanese prototype 787 Kyushu locol 6 car sets are in stock. 2/8/2012 Kato N scale SD90/43MAC locomotives are in stock. 1/27 Bachmann Sound Module (by Soundtraxx) for the HO Scale EM-1 2-8-8-4 Steam Locomotive is in stock. Video of the loco in action. 1/13 TopHobbyTrains Kato N Scale P42 Sound package is upon the site. 1/13 The long out of stock Kato N Scale Driver with traction tire for the N Scale Mikado Steam locomotive is back in stock. 1/7 Micro-Trains January 2012 releases are now in stock. Ringling Brothers cars and wagons will be in mid month. 1/6 Kato N Scale Pennsylvania GG1 Red Single Stripe, N Scale Pennsylvania E8A new road numbers are in stock. 1/5/2012 Kato N Scale 4-6-4 Steam Loco Japanese prototype. 12/21 The New Digitrax DN163K4B decoder for the Kato N Scale MP36PH is now in stock. 12/16 Bachmann HO 2-8-8-4 EM1 Steam locomotives Undecorated early and late models are in stock. 12/16 TCS K4D6 decoder for the Kato N Scale MP36PH is in stock. 12/15 updated our Video page with new F40PH lighting package and an updated Bachmann N Scale ten wheeler video. 12/8 Bachmann HO Scale 2-8-8-4 Steam locomotives are in stock. Nice! 12/8 Micro-Trains December 2011 Releases are in stock. 12/6 Kato N Scale PRR Broadway Limited 4 car sets are back in stock. 11/30 Restock of the Kato N Scale MP36PH Diesel. 11/10 Kato N Scale SD45 in SF, UP and SP are in stock. Kato's latest run of the N Scale Santa Fe Super Chief is in stock 4 and 8 car sets. 11/10 Con-Cor N Scale and HO Scale Zephyr Twin Headlight add in cars are in stock. TopHobbyTrains is a discount N Scale retailer that provides the (Model Railroading) community with great products and personalized service. TopHobbyTrains is a family business set up to enhance the modeling experience for both our customers and ourselves. We carry all of the major manufacturers and have a large inventory of the latest releases ready to ship. We are always adding to our manufacture offerings. Our discounts range from 20% to 40% on most items. We want to be your primary source for N scale trains and model railroad equipment. TopHobbyTrains is much more than a discount store we also provide N Scale advice to modelers from beginners to veterans. We are modelers ourselves having been in the hobby from the old Aurora Postage Stamp Trains days (over 37 years). TopHobbyTrains also has a DCC installation service. Our sound versions of the Kato N Scale GS4 and GG1 using SoundTraxx and LokSound decoders have been revered worldwide. Whether you purchase the loco from us (at a great discounted price) or from others, we can custom install the DCC electronics for you. We also can install simulated MARS lighting in your loco. We can do this modification on the Kato, Intermountain, Bachmann and Atlas line of locos. TopHobbyTrains is an authorized Kato, Con-Cor, Micro-Trains, Digitrax, SoundTraxx, Intermountain, TCS and Walthers dealer. We carry the entire product line for these manufacturers. We accept pre-orders for upcoming releases allowing our customer the ability to tailor their collection purchases on a standing order basis. Additionally we offer a conversion service on all locomotive and rolling stock items purchased from TopHobbyTrains. TopHobbyTrains accepts pre-order reservations for all upcoming releases so that our customers don't miss out on their favorite equipment and road names. If you collect the Classic Metal Works Mini Metals line of N Scale vehicles take a look at our inventory. We stock the latest releases and also have a good supply of prior years offerings. We have in stock the Kato SD70M, SD70MAC, PA/PB, AC4400CW. The Kato 4-8-4 GS4 Southern Pacific Morning Daylight is a favorite for modelers of all scales. Atlas Code 55 track, Code 80 Track, Diesels and more are standard stock items for TopHobbyTrains. We have all of the Bachmann, ConCor and Life-Like recently released steam locomotives including the 2-10-2, 4-8-4 Northern, and 4-8-2 Mountain. Walthers Hiawatha Twin Cities passenger car sets are a big hit for N Scale modlers. Digital Command Control (DCC) is fast becoming the standard in model railroading. We carry all the Digitrax controllers, boosters, power supplies and decoders. See our index for more model railroad information on things like electronics, track cleaning, and track layout. Please visit the links at the left to view the fine products we carry. Give us a try!